The Vegas Golden Knights are in an unfamiliar position. After having six draft picks in the first three rounds during last year’s entry draft, they now have only one. They are one of only five teams (New Jersey, Nashville, Calgary, San Jose) to have a single pick in the first three rounds, and only Nashville and Calgary make their first selection of the day after Vegas. Instead of using this draft to build a pool of prospect,s Vegas will be more focused on expanding the depth of their organization. Their second-round pick at 61 overall is their best chance at choosing a player that can have an impact at the NHL level. They have six picks in the last four rounds, but at that point, picks are more of a dice roll than anything else. The team’s effort will be focused on which player to take with their first pick, but it is hard to project which players will still be left on the board with so many teams deciding before them. That being said, the five players listed below are the best options for Vegas who will realistically still be available at 61 overall. 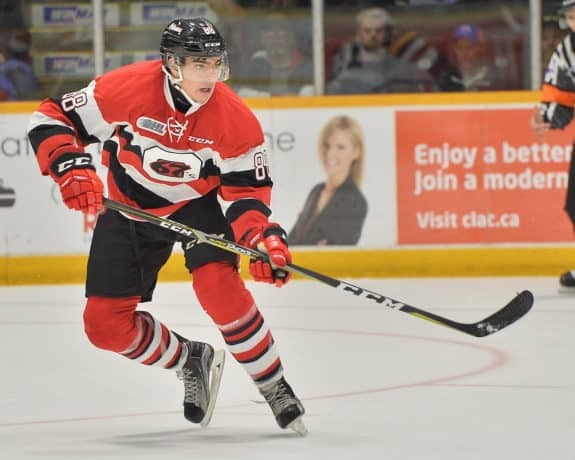 Five draft rankings were consulted when building this list: THW Ryan Pike’s Top 125, THW Larry Fisher’s Top 100, and TSN Craig Button’s Top 100, as well as the full rankings of NHL Central Scouting and Future Considerations. Vegas’s weakness in its prospect pool is wingers, so you’ll be seeing a lot of them on this list. We start off with the highest rated of the bunch in Ylonen. Much debate surrounds him as a player, with some ranking him in the first round and some placing him in the late third round. Ylonen has dynamic offensive ability, but his defensive game leaves a lot to be desired. He also struggles in puck battles due to his slight stature. Ylonen, however, is worth the gamble for Vegas. The skating and passing ability he already possesses should overcome his weaknesses if he can get a few years to develop. As shown in the playoffs for Vegas, teams need depth players that can contribute offensively. Even if Ylonen can’t become a top-six player, he would be a perfect third line player to bolster the bottom six offense. Ranta is typically rated lower than 61, but his attractiveness as a pick is due to him being a safe bet compared to the others on this list. He is a two-way player whose strength keeps him on the puck and allows him to skate powerfully. He has no skills that stand out as particularly game-breaking; instead, the benefit of picking Ranta is that he has a well-rounded skillset. He is a safe pick during a time in the draft where those types of players are rare. Once again Ranta fills a depth hole for the Knights. He is a player that projects as a middle six winger that could reasonably play on both special teams if needed. Since the Golden Knights have only one high draft pick, making the safe pick might be the best option for the team. They need to make sure they get a player that will pan out since their later picks are unlikely to make the NHL at all. 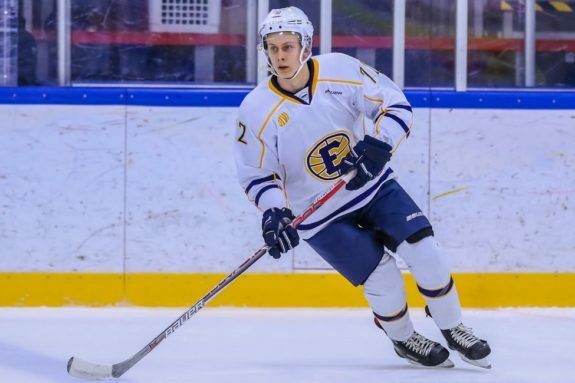 Fortier actually plays center with his team in juniors, but is usually listed as a winger and has played international tournaments on the left wing. Fortier is small at only 5-foot-10 but plays larger than he is. He is focused on playing hard at both ends of the ice and projects to be a great penalty killer. 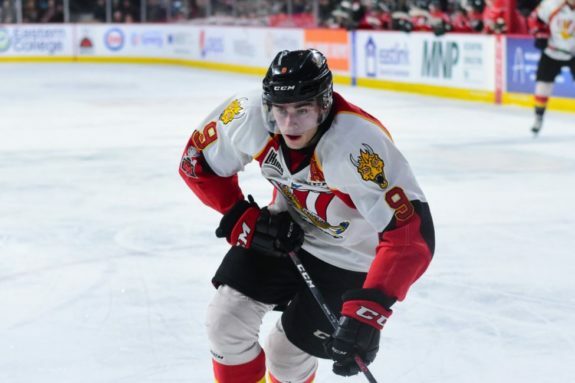 There aren’t many who believe that Fortier will be anything more than a middle six penalty killer at best, but he is a hardworking and intense player that will bring his all for any team that drafts him. A good comparison in the NHL is Andrew Cogliano. Like Cogliano, Fortier is not only skilled defensively, he is a threat to score shorthanded if given the opportunity. Vegas could use another depth player that is always a threat to cause a breakaway and plays with heart every shift. This draft is full of defensemen from the first round on down. But most defensemen ranked in the first and second rounds are quicker, two-way players if not purely offensive defensemen. Bahl is an old-school shutdown guy with little offensive upside. The big question facing a player like Bahl is if he can keep up in today’s game that relies so much on speed and quick transitions. Luckily for Bahl, he makes up for his lack of footspeed with smart positioning and surprisingly agile skating. His offensive downsides are what is driving Bahl further down most draft boards, but if Vegas feels as though his proven defensive ability outweighs that fact, he could be a solid late second round pick. Vegas knows they need reliable bottom four defensemen after what they went through in the Stanley Cup Final, and Bahl could prove to be a steal if he can work on his puck-moving ability. Dostal stole the show for the Under 18 Czech National team, where he played 10 games and posted a .925 save percentage. That included a 33-save performance against Canada in a quarterfinal game at the U18 World Championship that sure got him a second look from NHL scouts. At only 17 years old he became the starting goalie for his team in the second-tier Czech league where he continued to impress. His focus and ability to follow the puck made him the highest rated European goalie according to NHL Central Scouting. Goaltending is not a big weakness for Vegas. Even past Marc-Andre Fleury, the team has Malcolm Subban and Oscar Dansk who could both develop into NHL goalies. 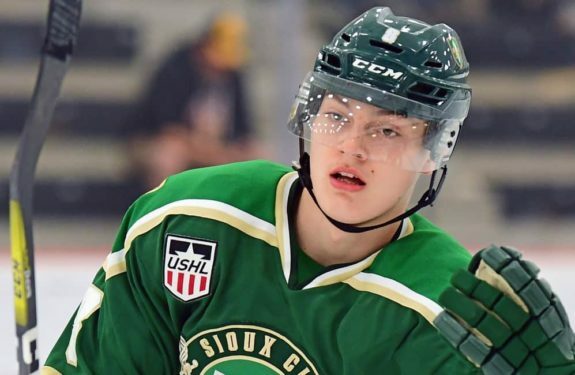 However, it’s never a bad thing to have organizational depth and Dostal may be worth taking a shot at late in the second round. Fleury won’t be around for too many more seasons, and Dostal has all the signs of a top goalie prospect in the making.